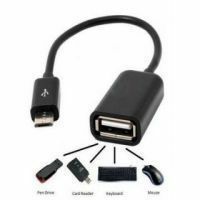 With this Micro USB Host OTG cable (On-The-Go cable), you can access most USB Flash Drives, Mouse, Keyboard and etc (note: some external devices may not be compatible). This cable is the PERFECT LENGTH! Not too short, not too long! Works perfectly with the Acer Iconia A510, Samsung Galaxy S II, Galaxy Note, Galaxy Nexus, Nokia N810 / N900, Motorola Xoom, Archos G9, Toshiba TG01 and other devices that support USB Host mode. (please be sure your device supports USB Host Mode) Almost all mobile phones with micro usb. This USB Host Cable also works with most external hard drives, USB Flashs etc. Depending on your device you may need external power.